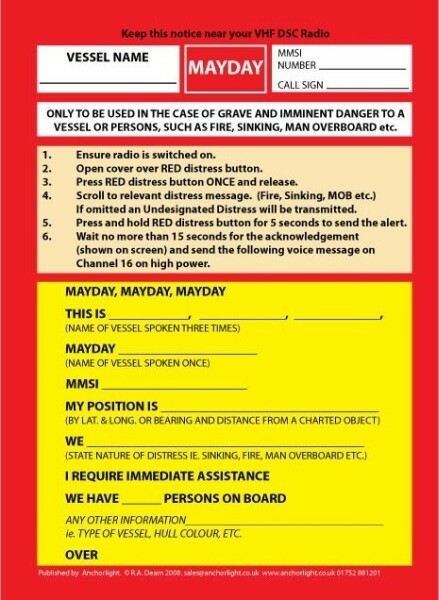 Designed to be displayed near the DSC VHF this essential reference card has blank spaces where you can write your boat name, MMSI number and Call Sign using a permanent marker pen. 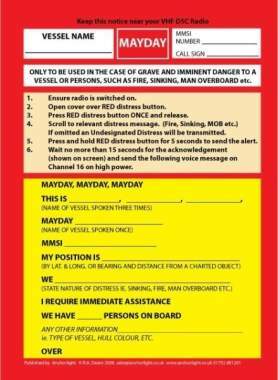 The first part of the card leads the user through the DSC Alert and the second part shows the spoken Mayday procedure. However well the skipper knows the procedure it won't help if she has fallen overboard and her inexperienced husband is left fumbling with the radio! Printed using light-fast ink and encapsulated with a heavy duty plastic for cockpit use and abuse.